China is opposed to the European Commission's plan to extend for another 15 months anti-dumping duties on Chinese shoe imports, and the move, if approved, would further pressurize struggling domestic shoe manufacturers, the Ministry of Commerce said. The European Commission yesterday announced it had proposed extending anti-dumping duties on European Union (EU) imports of Chinese and Vietnamese shoes for at least 15 months. 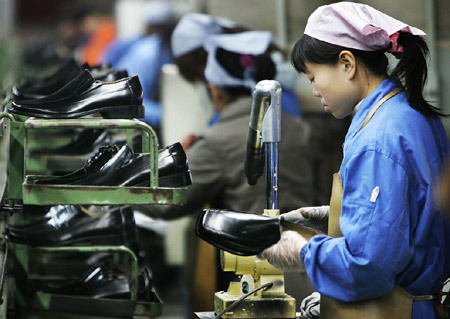 Early in 2006, the EU began imposing duties as high as 16.5 percent and 10 percent respectively on Chinese and Vietnamese shoe imports after European manufacturers accused the two governments of unfairly subsidizing their shoemakers. They also claimed the subsidy had squeezed profits of some EU producers while shuttering others. "The investigation showed there was a likelihood of continuation of injury for the short-to-medium term, until the process of adjustment of the Community (EU) industry had been completed. The anti-dumping measures on leather footwear should be maintained," a document released by the commission stated. But China is against any such proposal. "It's time to end the anti-dumping duties; it's harmful to both sides. Such protection is not good for creating an environment of fair competition," an official from the Ministry of Commerce told China Daily. Trade analysts suggested yesterday that the Chinese government and local shoemakers should consult with the commission and its member nations before Nov 3, after which, the commission would start talks on the matter and finalize its decision. Among the 27 EU member governments, the majority, including Austria, Belgium, Britain, Germany and Finland, is opposed to the extension plan. But major shoe-making nations such as Italy, Spain, France and Poland have insisted on retaining it. Normally, the extension period lasts for five years, but the European Commission has shortened it to 15 months in a bid to win more supporters before the deadline for determination in December. After Nov 3, EU trade officials will discuss the extension proposal, before a full vote by ministers in December. The measures must be approved by a majority of the 27 members. China and the industry will have about one month to respond. "We will communicate (to the EC), with support from more nations, about the proposal, and show them we are not dumping shoes," said Guo Weiwen, secretary-general of the EU Shoe Anti-dumping Case Association. Since 2006, shoe exports to the EU have been sliding, and the situation has become worse after the outbreak of the financial crisis last year. "We had hoped the nightmare would end after two years of duties. We will be deeply hurt if it (the extension) is approved," she said. He Weiwen, a senior World Trade Organization expert, said: "The anti-dumping case against shoe imports is unreasonable, and the idea of extending the duties is also unfair." But considering the diminished economic clout of the supporting nations and their influence on the other EU members, the extension proposal would "probably be given a nod" and the industry should "ready themselves for the worst", He said. "China could then consider appealing to the WTO and the European Commission." The European Footwear Alliance, representing global brands Nike, Adidas and Timberland, have opposed the decision. Major retailers too have opposed the move. Also yesterday, China asked the WTO to set up a dispute settlement panel to rule on the legality of EU's punitive anti-dumping duties of 85 percent on screws and bolts, the first time China has resorted to the trade arbitrator for ruling against the EU. In 2006, China did so against the US for the first time for a ruling on coated paper.